Sienna could hear her breath rasping in her throat. She tried to hold down her anxiety, but panic overtook her in waves as she realized that footsteps were coming toward the room. Looking around the room, Sienna’s eyes jumped around trying to find a good place to hide. “There!” she thought as she noticed a large wardrobe in the side of the room. She attempted to move her feet and found herself frozen in place by fear. Her breath was now coming in gasps as her entire body began to tingle and stiffen. She tried desperately to run but her vision began to narrow as everything started to turn grey around the edges. Sienna couldn’t move. The footsteps stopped in front of her. 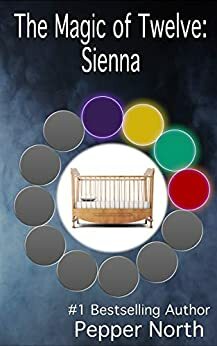 Sienna has always depended only on herself for survival. Now, she is transported to the care of a sorcerer who has been preparing for her arrival for a very long time. Sienna will find a bond that unites her for a future she only fantasized about when reading those books on her tablet. Pepper North brings you the fourth story in a magical new age play series! The Magic of Twelve will share the stories of twelve women transported on their 22nd birthday to a new life as the droblin (cherished Little one) of a Sorcerer of Bairn. These magicians are much older and physically larger. They have waited a long time to take complete care of their droblins needs. They will protect their precious one to their last drop of magic. The characters from the twelve novels in this series reappear to continue their stories. The novels are all complete stories. You do not need to read them in order, but Pepper thinks you may enjoy them more fully if you do! The books in this series will feature invasive medical treatments, including thorough examinations and enemas, when required, as well as diaper changes, spankings, and other punishments. If you are offended by age play (adults who choose to live as a Little or a parent of a Little), or dubious consent, this is not the book for you. Great Story, love how the evil used water this time & put her right in front of the Sorcerers, love the new daddy that was introduced (Drake), can't wait to read the rest of the twelve books . Pepper North again you have thrilled, excited and rewarded us. The sweetness of the droblins and love of the love of the Daddies continue to grow. Thank you. Can’t wait for Drake and pearl. Good story wish it was longer. I'm curious what the big bad is, but I'm assuming we won't know till closer to the end. Can't wait for the next book. 5.0 out of 5 starsHas a good ending. Not sad. Always love these types of books. I am so enjoying these series if magical books from Pepper. Age play is number one on top of the lists so its always with pleasure to buy another one.